As far as novels are concerned, I am sometimes alarmed by how little I remember about those that I have read. A friend of mine just recently posted that she was excited about the release of a BBC program based on the book Jonathan Strange and Mr. Norrell by Susanna Clarke. She said it is one of her favorite books. I read that book, too -- I think, even, that it had been at her suggestion, quite a few years ago. I remember having enjoyed it very much at the time. Yet -- I couldn't tell you anything about it today. I'd actually completely forgotten about the book. It would seem to make no sense. I remember even recommending it to others, back then, having liked it as much as I did... Still, almost no recollection about the story. So, how is it that I could have enjoyed that book and have, today, almost no memory of it? 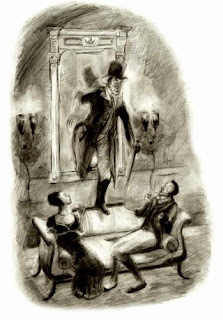 An illustration fro the novel. Is it that ....Strange and...Norell... is just not a good book; that it's a page-turner without enough depth to latch on to my haughty literary expectations? I am completely sure that's not the case. My friend is no dummy. She would not enjoy a book without substance; we studied literature in grad school together and she was one of the sharpest knives in the rack. There's no way we're talking about empty pop lit. here. Literary quality does not necessarily equal literary enjoyment. Literary enjoyment does not necessarily preclude quality, nor does it prove quality. It's literary impression that matters. For some reason, Jonathan Strange and Mr. Norrell made an impression on my friend that it did not make on me, even though we both liked it. I'm sure there are other books we have mutually read that work in the opposite. Thankfully, the complex maze of factors that comprise the sort of impression a book makes on a reader is well beyond my understanding. I don't want an answer; I just want the joy of that experience of a book "touching my heart" or of its really "getting into my head." You never know when the lightning will strike. That's cool. At any rate, having liked the book, I will certainly watch the BBC series of Jonathan Strange and Mr. Norrell when it starts up.